Department of Chemistry, Faculty of Science, Princess Nourahbint Abdulrahman University, P.O. Box 28445, Riyadh, 11437, Saudi Arabia. ABSTRACT: Using inductively coupled plasma optical emission spectroscopy (ICP–OES) I determined the concentrations of heavy metals, arsenic (As), mercury (Hg), lead (Pb), cadmium (Cd) and aluminum (Al) element after digestion using microwave pressure for 32 different types from the most popular and widely sold lipsticks in Riyadh markets. Analysis was conducted for the samples of expensive and cheap brand that advertise itself a natural (organic) and which advertise itself a medical. Samples of lipsticks from different countries were analyzed but with emphasis on China. I studied different concentrations of investigated elements with a different degree of color intensity, and gradation from the dark red to the light beige that shows the presence of significant differences in concentrations of the elements in the sample. The concentrations of investigated elements were also compared to the matte dry lipsticks and between the lipstick glosses and liquid lipsticks and between the lip glosses and the watery lip glosses and between white lip balm and the long lasting lipsticks. The results showed that only two samples of all investigated samples groups which were represented in the Chinese product category that contained arsenic which exceeded the allowable detection limit in one of them, as its concentration in the sample reached 3.44 ppm, and mercury was found beyond the permissible detection limit in only one sample of the samples under consideration, which were represented in the group of expensive international brands samples, and its concentration was 1.584 ppm, while in the remaining samples it ranged between 0.001 - 0.070 ppm, which indicates that expensive products are not necessarily safe in term of mineral content. The lead content exceeded the allowable limit of 20 ppm in only three samples of lipsticks found in the lipsticks group of Chinese products while in rest of the samples of different groups lead value ranged 0.7 - 12.34 ppm. In this study it became obvious that China is the main manufacturer of investigated lipsticks, and it was found that the samples contained high and serious lead levels, while cadmium in all investigated samples of lipsticks was found to be below the allowable detection limit, which ranged from 0.06 - 8.81 ppm. Aluminum element that presents naturally in high concentrations in cosmetic products, its concentration in the investigated samples ranged 8.76 - 23.418 ppm. Elements content in the samples were compared with the available data on the global limits proposed to these elements and their potential health hazards on the consumer public. INTRODUCTION: The threat of any contaminant to human health is a function of its concentration in the body, in recent times attention had been focused on cosmetics, disinfectants and other personal body care products as major sources of heavy metals in human systems 1, 2, 3. Actors use specialized forms of cosmetics too, in order to change their physical appearances 4. A large number of heavy metals are present in lipsticks. Some of these are used as coloring agent. Skin care products fall in general category of cosmetics. These are used to improve the appearance and health of skin. Skin functions as a protective layer 5. It allows some chemical substances to pass through it, while it does not allows some other chemical substances to pass. Some cosmetics products are directly applied to the skin such as lipsticks. These enter into the body and cause the hazardous effect to the internal body organs. Cosmetics are the important source of releasing heavy metals in the environment 6. The toxicity of heavy metals is well documented. At low concentration, some of these elements can cause damage to the internal body organ of animals and humans. Metal poisoning was reported to cause various mammalian cancers, respiratory diseases, failures in organ function and intellectual retardation 1. Heavy metal can appear as impurities in finishing products 7. It is acknowledged that heavy metal impurities in cosmetic products are unavoidable due to the ubiquitous nature of these elements, but should be removed wherever technically feasible 8. Most chemicals are added to cosmetic product in the form of preservatives and fragrances. Some of the preservatives and fragrances are toxic and prohibited from the usage as ingredients, because they can cause cancer, mutation, reproductive toxicity, and endocrine disruption 9. All heavy metals are prohibited for use in cosmetics, although the presence of traces is allowed if their presence is technically unavoidable in good manufacturing practice, as per the cosmetic products group standard 10. Arsenic, cadmium, lead and mercury are described as heavy metals which in their standard state have a specific gravity (density) of more than about 5g/cm3 (arsenic, 5.7; cadmium, 8.65; lead, 11.34; and mercury, 13.55) while metals like copper, nickel, chromium and iron are essential in very low concentrations for the survival of all forms of life, but, when present in higher concentration can cause metabolic anomalies 11. These heavy metals have been indicted in varying concentrations in various cosmetics, also bearing in mind that some of these metals have been banned as intentional ingredients coupled with their known or probable negative effect 10. Mercury compounds are readily absorbed through the skin on topical application and have the tendency to accumulate in the body. They may cause allergic reactions, skin irritation or neuro-toxic manifestations 12. Significant level of cadmium was found in cosmetic products, in spite of the fact that cadmium was prohibited in any amount in cosmetics 1. The presence of cadmium in the samples can also have harmful effects on the human body. Small amounts of cadmium may result in heart disease, hypertension, kidney and liver damage, and weakened immune system 13. Cadmium is present in many cosmetics products but mostly present in lipsticks and face powders. Its color is deep yellow to orange. It is used as color pigment in many cosmetics industries 14. Health Canada has recommended that the maximum cadmium concentration is 3 µg/g in cosmetics. Therefore, a trace amount of cadmium is not safe 15. Heavy metals like lead and cadmium are common contaminant in various cosmetic products 16, 17. Iran, then Saudi Arabia has the highest consumption of cosmetics in the Middle East. The aim of this study was to assess the public health risk from certain brands of lipsticks products. Also Pb and Cd were found in lipsticks and eye shadows 18 and some aluminium compounds are colorants in lip glosses, lipsticks and nail polishes 19. Khalid et al., also indicated that the highest concentration of heavy metals was in lipsticks with dark brown and shocking pink colors, and cosmetics with pink color had the lowest metal contents 20. Cheap brands of lipsticks and eye shadows imported from countries with poor safety, regulatory and manufacturing practice but sold in Riyadh stores in Saudi Arabian were analyzed. Lead was found with the range 0.27 - 3760 ppm for lipsticks and 0.42 - 58.7 ppm for eye shadow 21. With the economic benefit, it is a challenge to manufacturer to provide a good quality product with low cost and at the same time environmental friendly. Despite the positive news related with cosmetics and beauty industry, one cannot run from is the fact that the safety of the cosmetic used is always at top priority 22. Heavy metals commonly present in cosmetic and personal care products as impurities 23. Campaign for safe cosmetics (2009) stated that heavy metals are not listed as ingredients in some cosmetics due to lack of manufacturer testing or regulatory oversight. It is possible that the companies are not even aware that the products are contaminated and these contaminants likely get into the products when poor quality ingredients are used. Inadequate purification of the raw materials could also be a factor 24. Use of cosmetic products is increasing rapidly in KSA, and various chemicals including the heavy metals are used in the cosmetics which pose health risk to consumers. Heavy metal is focused as it has becomes a concern in recent years with increasing number of news related to it and study done to detect these elements in cosmetics. The concern over it has led several countries to provide guideline for heavy metals impurities limit in cosmetics 25. The present study was conducted to determine 4 heavy metals (arsenic, lead, cadmium, mercury) and aluminium element in different types of lipsticks, available in the Saudi markets. The results were compared with the available standards due to the lack of a standard or reference material to compare the samples under investigation. This research aims to test and verify the level of commitment to match the samples of different qualities and type that have been purchased from the shops of commonly used international brands and from low cost retailers with the general specifications of cosmetics. Samples Description: In this study 32 samples, 23 brands of cosmetics products comprising lipsticks, lip glosses, lip balm were collected from different cosmetics stores in Riyadh markets, KSA. The samples were of different qualities and type and popular brands with different price ranged from cheap to expensive and from different manufacturing origin. They were arranged into groups according to the nature of the study, and five different countries were selected (USA, France, Italy, Japan, China) but one product may contain many samples, which were analyzed separately. They were imported from developing countries where quality control measures do not apply. These groups of samples include the color group for studying the intensity of color and its effect on the lipsticks, as 7 colors and specific lipstick brands, ranged from dark colors, red, brown, dark pink, light orange, and beige, light pink, and purple. The samples were rated into categories of brands samples, the group which calls itself an organic and the other which advertise itself a medical. The soft lipsticks were obtained and compared with the solid lipsticks and also the solid dry lipsticks were compared with the lip glosses (water color) and lip balm (white color) and with the long lasting lipsticks that remains for a long time. Samples Digestions: The sample is destroyed/ digested by high pressure microwave digestion using nitric acid, hydrogen peroxide and accurately weighed, to the nearest mg, 0.20 - 0.30 g of sample into a high pressure resistant 50 mL quarts or PTFE vessel. 6.0 mL of concentrated nitric acid (HNO3) and 2 mL of a 30% of hydrogen peroxide solution was added. Carefully sealed the digestion vessel lid and allowed it to stand at room temperature for at least 15 min to ensure that the initial reaction is complete. Sealed digestion vessel was placed into microwave digestion system and digested using the specified program. After cooling to the room temperature, 20 ± 1 mL of double distilled water was added to the digested sample solution and filtered through Whatman No. 1 filter paper into 50 mL volumetric flask using further small quantities of double distilled water. From the parent solution, 6 standard solutions for each measured metal were prepared, and all necessary precautions were taken to avoid any possible contamination to the sample. Sample Analysis: The digested samples were analyzed to determine arsenic, cadmium, lead, and mercury using inductively coupled plasma optical emission spectroscopy (ICP-OES). The statistical analysis (SPSS) was conducted to determine the descriptive and inferential statistics such as (T) test and (Mann - Whitney Test) to find out whether there are significant differences in the concentration of elements in lipsticks samples under study, and P (0.05) value was considered as a significant value. RESULTS AND DISCUSSION: In this study 32 samples of lipsticks were investigated for the presence of heavy metals, including: arsenic, lead, mercury, cadmium and aluminum. Arsenic was detected in only 2 of investigated samples, while its concentration in one of the two samples was found to be above the detection limit, 2 ppm. The remaining heavy metals under consideration were found in varying quantities. Lead and mercury were of concern in the prior studies of lipsticks, as lead was found - beyond the detection limit determined by food and drug administration (FDA) which is 20 ppm in only 3 samples while its presence in the remaining samples ranged between 0.70 - 12.43 ppm within the range reported in the prior studies. Mercury was detected in the investigated samples and was found below the detection limit of 1 ppm, excluding one sample in which the concentration of mercury was found beyond the allowable detection limit. Mercury was not detected in only 4 investigated samples of lipsticks while it was found in the remaining samples with lower concentration of 0.001 ppm. Cadmium was detected in all samples with a wide range of concentrations within the allowable detection limit, where its concentration in the samples ranged between 0.06 - 8.81 ppm. Aluminum was detected in all investigated lipsticks samples with high concentrations and some of its compounds are considered as colorants in the lipsticks, where its presence in the samples ranged between (8.76 - 23410 ppm). While conducting the statistical analysis to the lipsticks samples, statistically significant differences were found at a significant level of (0.05) in the concentration level of lead, cadmium, aluminum in the samples under study. There are no statistically significant differences in the concentration level of mercury, which showed the convergence of its concentration level between the samples under study. While arsenic was detected in only 2 samples of this study, it was not included in the statistical analysis, as its point of presence was only indicated in the group of investigated samples. 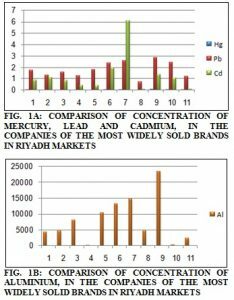 Comparison was conducted for concentration of mercury, lead, cadmium, and aluminum in the lipsticks samples between the most widely sold brands by different companies in Riyadh market, and significant differences were found in the concentration level of mercury, lead, cadmium and aluminum, which showed varying concentration levels of all those elements in the investigated samples. While Arsenic was vanished in this group of samples, mercury recorded high presence at 0.07 ppm, whereas it was absent in some samples. Lead recorded high and low value in this lipsticks group at 2.82 ppm and 0.70 ppm respectively, where cadmium recorded high value of 6.06 ppm and low value of 0.06 in these samples. Aluminum recorded its highest value of 23410 ppm and lower concentration of 85 ppm, and it is considered as one of the elements of high concentration in the lipsticks and cosmetics in general. The following Table 1 and Fig. 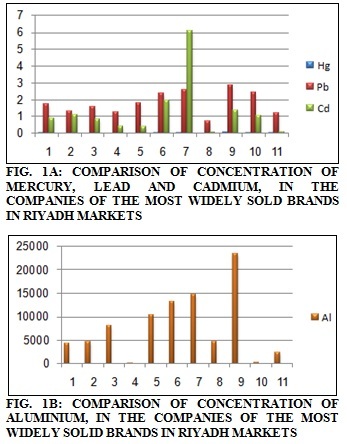 1a and 1b shows concentrations of mercury, lead, cadmium and aluminum in the companies of the most widely sold brands in the Kingdom's markets. Distributions of heavy metals under study were investigated between the companies, and as they are natural organic, statistical analysis showed statistically significant differences at the level of significance P(0.05) in the lead concentration within the samples of this group. Vanishing of mercury with a ratio of 66% from the group of the organic lipsticks samples was observed, and its presence in the other samples has occurred with low concentrations as it reached 0.001 ppm, while cadmium and aluminum were found with convergent concentrations in the samples of this group as no significant differences were found in their concentrations. Arsenic was entirely not appeared in the samples of this group. When comparing the concentrations of mercury, lead, cadmium and aluminum in the lipsticks samples for the companies that advertise themselves an organic with concentrations of the same elements in the lipsticks samples of the inorganic companies, significant differences were found in concentration of mercury, as it recorded high content of 0.001 ppm in samples of the organic group while in an inorganic group it recorded the highest value of 0.055 ppm. No statistically significant differences were found in the concentration level of lead, cadmium and aluminum which showed the convergence of concentrations of these elements in the two groups of organic and inorganic lipsticks, by applying the statistical test (Mann-Whitney Test). Contents of heavy metals, mercury, lead, cadmium and aluminum were investigated in the lipsticks for the brands which advertise themselves a medical and less harmful than other similar brands, where low concentration and absence of mercury were found in some samples of this group, as it reached its high value of 0.013 ppm, and no significant differences were found in concentration of mercury in this group of samples. Significant differences between the samples of this group were found in the concentration level of lead, where it reached its highest value of 2.56 ppm, while its concentration in this group decreased to a low level compared to the similar elements in the same group and it reached 0.07 ppm. Variation in concentration of cadmium was observed in these samples as it recorded its highest and low concentration at 0.06-6.06 ppm. The variation in concentration of aluminum reached its highest and low value at 2103-14658 ppm. Statistically speaking, no significant differences were found in concentrations of mercury, cadmium and aluminum in the samples of this group, and arsenic was not present in any of the samples of this group. When comparing the concentration of mercury, lead, cadmium and aluminum in the group of medical lipsticks samples, with concentrations of similar elements in the non-medical samples of the lipsticks, statistically significant differences were found at a significant level of P(0.05) by applying (Mann Whitney Test) in the concentration level of mercury for both medical and non-medical groups, where mercury was vanished in some samples of the medical lipsticks, and recorded low concentrations in other samples, where its concentration increased slightly in non-medical samples of lipsticks as it recorded its high value at 0.055 ppm in this group. Variation was observed in concentrations of cadmium and aluminum between the samples of the two groups, where the samples of medical lipsticks showed higher concentration of cadmium and aluminum than the group of non-medical samples, while the level of lead content was convergent in both groups. Different contents of heavy metals, arsenic, lead, cadmium and aluminum elements were investigated in the expensive brands of lipsticks, as they were considered that they have more safe and less harmful contents of toxic elements compared to the cheap brands. Lead, cadmium and aluminum were found with varying concentrations in all investigated samples, where lead has significant differences in its concentration within samples of this group, as it reached its highest concentration 2.38 ppm and low concentration 1.07 ppm. No significant differences were found in concentration of cadmium and aluminum in the investigated samples. Arsenic was not found in the samples of this group. What was observed on this group of samples, that one of the samples contained mercury above the detection limit proposed by saudi food and drug administration (SFDA) of up to 1.0 ppm as its concentration in the sample reached 1.584 ppm. The results showed that the expensive cosmetics are not necessarily safe in terms of heavy metal content. When we investigated the concentration of the five elements in the lipsticks samples for the brands of medium value, significant differences were found in concentration of lead and cadmium as it ranged in the samples from 1.333 - 2.86 ppm and 1.06 - 2.10 ppm respectively, while no significant differences were found in concentration level of aluminum and mercury which showed the convergence of their concentration in this group of samples. Arsenic also had not appeared in that group. Studies of arsenic, mercury, lead, cadmium and aluminum concentrations in the cheap lipsticks have been expanded. Stores that sell the cheap Chinese products have recently widely spread in Saudi Arabia, where lipsticks price is nearly one or half USD. Eight samples of lipsticks were selected from different Chinese brands. Table 2 shows the concentration of investigated elements in the sample of this grouping, as our fears stem from safety of the cheap cosmetics in many cities of Saudi Arabia including Riyadh. Most of these products were imported from countries with poor safety, regulatory and manufacturing practice, as well as they have no conditions of manufacturing specifications, so arsenic was found in two samples of the cheap Chinese lipsticks grouping. Arsenic in one of the samples that were found above the detection limit determined by the (FDA) in concentration of 3.44 ppm. Lead recorded very high presence in 3 samples of this grouping as it was found above the allowable detection limit of up to 20 ppm, which indicates the danger of frequent uses of these cosmetics, while the concentration of mercury and cadmium remained within the range of detection limit in all samples of this group Table 2. Comparison was conducted in concentration of investigated heavy metals and aluminum element, between expensive, medium and cheap brands, and arsenic has only been detected in the cheap brands of lipsticks samples, while there were no big difference found in concentration of mercury between three samples of the group. High concentration level of lead was found in the cheap group of samples beyond the allowable detection limit in some samples, then it dropped significantly in the samples of medium price, and recorded its lowest concentration in the expensive brands of the samples grouping. Cadmium recorded its highest concentration in the cheap brands of the grouping, and the lowest one in the expensive brands, while aluminum recorded high content in the medium price lipsticks samples grouping. Distribution of heavy metals under study and aluminum element were investigated in 5 international trademarks of lipsticks from different countries, purchased for analysis, and there were the most prevalent in the markets. One brand may contain many samples and they were analyzed separately, and it is known that they were imported from developing countries in which the quality control does not apply. Samples were purchased from stores importing the cosmetics in Riyadh markets, these countries are (USA, France, Italy, Japan, China). The ratios of elements contents in the samples were as shown in Table 3, Fig. 2a and 2b. Concentration of lead and cadmium in Chinese products was found to be very high compared to their concentration in the products of other countries under study as it reached 2.97 and 12.43 ppm respectively. Mercury and aluminum were found with convergent concentrations in all investigated products of the countries excluding the lower content of aluminum in the USA products. Differences between the investigated samples were analyzed to know if there were significant differences in concentration of heavy metals: arsenic, lead, cadmium and aluminum element in different colors of lipsticks for one trade mark represented in the colors (red, violet / purple, brown, dark pink, orange, light pink and beige). Results as indicated in Table 4, Fig. 3a and 3b showed that there were statistically significant differences at P(0.05) in concentration level of mercury, lead and aluminum in the group of 7 colors which were analyzed. This indicates that the lipsticks used contributes with its contents of heavy metals and aluminum element to all selected colors of lipsticks samples. In this study the orange color showed high content of mercury (0.067) ppm, followed by the light pink, the dark pink then the beige color, while we find low content of mercury in the dark violet, brown and red colors compared to the light colors. Lead has recorded its highest content in brown and red colors while it reached its lowest level in the dark pink and beige colors. Aluminum element which is considered of high concentration in lipsticks recorded highest concentration in the dark violet, and its lower concentration in the light beige color. Despite the variation found in different colors of lipsticks in concentration of cadmium as it recorded its maximum value at 5.25 ppm in the red color and minimum value at 0.12 ppm in the light beige color, but statistical analysis has not confirmed these differences (P< 0.05). Comparison was conducted between the concentrations of elements under study in the matte dry lipsticks and glossy lipsticks of the same color level and brand, and we found the concentration of the four elements in the dry lipsticks more than in the glossy lipsticks. Despite that there was a slight increase in concentration of mercury, lead, and cadmium, but the concentration level of aluminum in the dry samples was enormous of up to 9484 ppm compared to its content in the glossy lipsticks of up to 5491 ppm which indicates that the glossy lipsticks is more safe than the matte dry lipsticks. Distributions of studied elements in the solid and liquid lipsticks of similar color and brand were examined and variations were found in the concentration level of the four elements, and with high ratio as shown in Table 5, where the concentrations of mercury, lead, cadmium and aluminum in the solid lipsticks exceeded their concentrations in the liquid lipsticks, as it was shown that the liquid lipsticks has low content of heavy metals and aluminum element under study than the solid lipsticks. When investigating the variation in concentration of the heavy metals and aluminum element under study, between the common colored lipsticks and the colorless watery lip glosses, big differences were found in concentrations of these elements between the two groups, where the concentration of these elements in the watery lip glosses was found to be lower than their concentration in the common lipsticks. Mercury content was found to be 0.055 ppm in the common lipsticks while its concen-trations in the lip glosses was 0.037 ppm, and lead was 1.75 ppm and became 1.00 ppm, cadmium dropped from 0.86 ppm to 0.15 ppm, while aluminum concentration was 4358 ppm in the lipsticks and became 15 ppm in the lip glosses, which showed the effect of colors in the presence of aluminum in high concentrations as it is used in these lipsticks samples as a color stabilizer. When comparing the concentrations of the 4 elements: mercury, lead, cadmium and aluminum between the common lipsticks and pearl lip balm, remarkable differences were found in concen-trations of elements within the 2 groups, as the concentration of mercury, lead, cadmium and aluminum in the pearl lip balm was found to be lower than in the common lipsticks. Concentration of heavy metals, mercury, lead, cadmium has not exceeded 1.00 ppm in the lip balm compared to their content in the common lipsticks. Aluminum concentration recorded 16 ppm in the lip balm while its content in the lipsticks was found to be 4358 ppm, which showed us that the lip glosses and lip balm have low content of heavy metals: mercury, lead, cadmium and aluminum which are more safe than the common lipsticks. The common lipsticks were compared with the long lasting lipsticks which will remain for a long time than the common lipsticks. It was shown that a decrease of mercury, lead, cadmium and aluminum occurred in the long lasting lipsticks compared to the common lipsticks. CONCLUSION: Cosmetics allow us to change many aspect of our physical appearance by enhancing our beauty. Nevertheless, we need to be careful not to cause any damage to our skin by using cosmetics. Cosmetics investigated in this work were observed to contain heavy metals that are toxic to human health, as five samples of cosmetics investigated in this study were found to be of higher concentration of heavy metals under study, with a ratio exceeding the acceptable limit determined by FDA. Continuous use of these cosmetics could result in an increase in the heavy metals level in the human body beyond acceptable limits. The expensive cosmetics are not necessarily “safe” in terms of heavy metals content; as such effort must be made to inform the users and the general public about the harmful consequences of cosmetics, regardless of the cost of the product. There is an urgency to halt importing unsafe cosmetics as lead in lipsticks might not cause an immediate health problem but its accumulative effects due to repeated application cannot be eliminated. Consumers should also play their role by keeping themselves updated with knowledge and aware of the ingredients presence in the products they used. Ayenimo JG, Yusuf AM, Adekunle AS and Makinde OW: Heavy metal exposure from personal care products, Bulletin of environmental contamination and toxicology 2010; 84(1): 8-14. Khalid A, Bukhari IH and Riaz M: Determination of lead, cadmium, chromium, and nickel in different brands of lipsticks, International Journal of Biology, Pharmacy and Allied Sciences 2013; 1(2): 263-271. Gunther S, Sven G, Jorg S, Waltraud K and Uwe S: Ullmann’s Encyclopedia of Industrial Chemistry, Wiley VCH Verlag Gmbh and co, California 2002; 5: 201-220. Esmaili I and Mehrjardi ZM: Determine the factors influencing the adoption of livestock insurance in Kerman city using parametric or nonparametric methods. Journal of Agricultural Economics, (c) 2010; 2(3): 16-30. Iravanian E and Single AM: Police station, Str., Unitary Mohammadi, S.h. Factors affecting crop insurance acceptance Ta fresh in the city. Journal of Agricultural Sciences Iran 2006; 2(37): 144-137. Adepoju-Bello AA, Oguntibeju OO, Adebisi RA, Okpala N and Coker HAB: Evaluation of the concentration of toxic metals in cosmetic products in Nigeria, Afri. J. Biotechnol 2012; 11(97): 16360-16364. Al-Dayel O, Hefne J, Al-Ajyan and Human T: Exposure to heavy metals from cosmetics, Oriental Journal of Chemistry 2011; 27(1): 1-11. Amasa W, Santiago D, Mekonen S and Ambelu A: Are cosmetics used in developing countries safe? Use and dermal irritation of body care products in Jimma Town, South Western Ethiopia. Journal of Toxicology 2012; 1-8. Kumar S, Singh J and Garg M: AAS Estimation of heavy metals and trace elements in Indian herbal cosmetics preparations, Research Journal of Chemical Sciences, 2012; 2(3): 46-51. Omolaoye JA, Uzairu A and Gimba CE: Heavy metals assessment on some ceramic products imported into Nigeria from China. Archives of Applied Science Research, 2010a; 2(5): 120-125. Chauhan A, Bhadauria R, Singh A, Lodhi S, Chaturvedi D and Tomar V: Determination of lead and cadmium in cosmetic products, Journal of Chemistry and Pharmaceutical Research 2010; 6: 92-97. Chizari D and Ghalavand K: Factors affecting the adoption of agricultural products between farmers in the provinces of Tehran & mazandran. SLSLH insurance papers Scientific Conference agricultural insurance, development and investment security 2006. Health Canada, Heavy Metal Hazard - Environmental Defense: the Health Risks of Hidden Heavy Metals in Face Makeup, 2011. http://environmentaldefence.ca/sites/defau lt/files/report files/ HeavyMetalHazard%20FINAL.pdf. Nnorom C, Igwe JC and Nnorom CGO: African J. Biotech. 2005; 4: 1133-1138. Saleh A, Enazi SA and Shinwari N: Assessment of lead in Cosmetic products, Regulatory Toxicology and Pharmacology 2009; 54: 105-113. Nourmoradi N, Foroghi M, Farhadkhani M and Dasjerdi VM: Assessment of lead and cadmium levels in frequently used cosmetic products in Iran. Journal of Environmental and Public Health 2013; 5, article 962727. Campaign for Safe Cosmetics. A poison kiss: The problem of the lead in lipstick. Retrieved from http://www.safecosmetics.org/article.php?Id=327. (2007a), (Accessed 6-5-2012). Khalid A, Bukhari IH and Riaz M: Determination of lead, cadmium, chromium, and nickel in different brands of lipsticks, International Journal of Biology, Pharmacy and Allied Sciences 2012; 1(2): 263-271. Iman A, Sami A and Neptune S: Assessment of lead in cosmetic products, Regulatory Toxicology and Pharmacology 2009; 54: 105-113. Draelos ZD: Are cosmetics safe? Journal of Cosmetic Dermatology 2012; 11: 249-250. Environmental defense canada, heavy metal hazard, the health risks of hidden heavy metals in face makeup 2011. Tsankov LU, Iordanova I, Lolova D, Uzunova S and Dinoeva S: Hygienic evaluation of the content of heavy metals (lead and copper) in cosmetic products, Problemina Khigienata 1982; 7: 127-136. Health Canada Guidance on heavy metal impurities in cosmetics 2012. http://www.hc-sc.gc.ca/cps-spc/pubs/ indust/heavy_metals-metaux_lourds/index-eng.php (accesses on 10 May 2014). Alnuwaiser MA: Determination of As, Hg, Pb, Cd and Al in the lipsticks in the kingdom of Saudi Arabia. Int J Pharm Sci & Res 2018; 9(11): 4750-58. doi: 10.13040/IJPSR.0975-8232.9(11).4750-58.